Compost in My Apartment? Really? 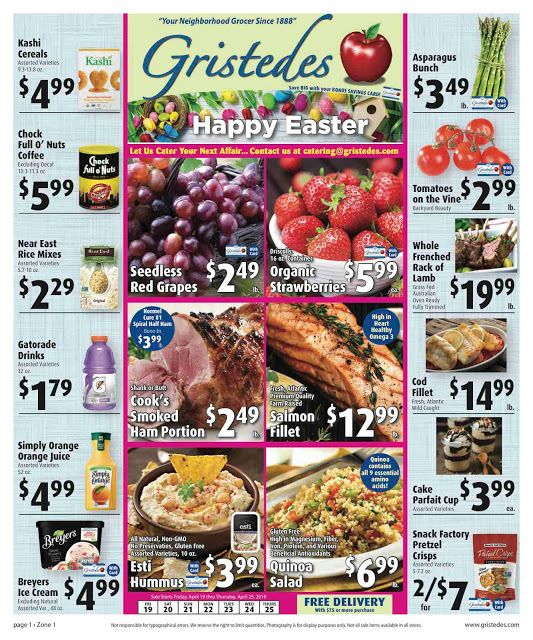 WHEN: Sunday, March 30th. 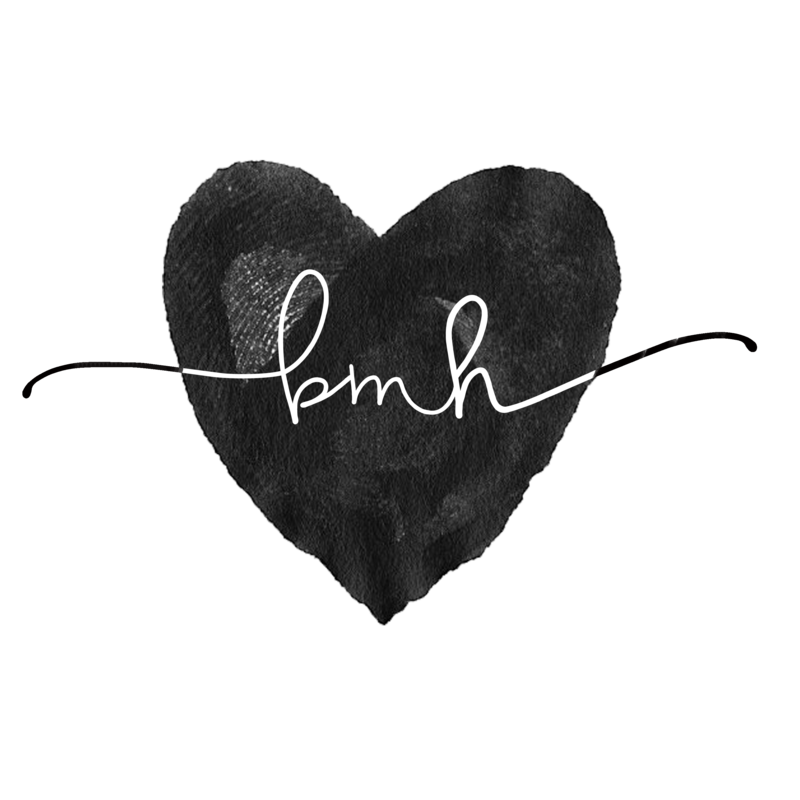 5-8pm. WHAT: Daniel Tainow, Compost Educator, from the Queens Botanical Garden to discuss how we can compost in our urban homes! The average New York City household throws away two pounds of organic waste each day. This adds up to over one million tons of organic waste per year, most of which is transported to landfills. The transportation of waste is very expensive and causes pollution. When organic waste is buried in landfills, it is cut off from oxygen and decomposers. By throwing away compostable materials we not only use up precious landfill space, we also discard a valuable resource that can help to grow beautiful gardens, lawns, and houseplants. Here's is an earlier post that includes a Roosevelt Island resident's description of the benefits of composting and a wonderful worm recipe for urban apartment composting. Yum Yum. The MTA is reporting that there will be no Manhattan bound F Train service from Roosevelt Island. 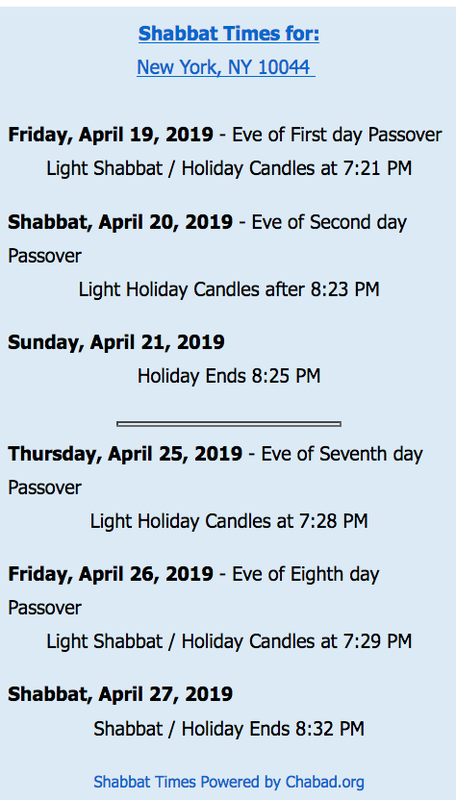 In other transportation related advisories, my understanding was that the Roosevelt Island Bridge advisory was to continue through this weekend but the current RIOC advisory web page only references a bridge advisory for work being done at the end of 2007 and start of 2008. The Child School Legacy High School will be holding an Open House on Wednesday, April 2 and are inviting their Roosevelt Island neighbors. Here is the invitation. We’re eager to show off our school and look forward to seeing neighbors! Roosevelt Island residents are invited to learn about our creative approach to special education. We’re opening our doors to the community so you can see our classes in action. Our administrative offices are set back off an open courtyard, down a short flight of steps on the west side of Main Street between M&D Deli and the RIOC offices. is an academically rigorous, yet supportive community addressing the needs of a diverse population of special children, many of whom have not found success in other schools. Our children learn differently because of disorders in thinking, listening, speaking, reading, spelling, touch, or perception, etc. The School fulfills a vital function in the New York City Public School System, serving the needs of children with learning, social/emotional and developmental disabilities throughout the five boroughs. It is chartered by the Board of Regents of the State of New York to accept youngsters whose needs cannot be satisfied within the public education system. Under this authorization, The Child School is classified as an approved non-public day school, whose students may qualify for 100 percent tuition payment by New York State. Artificial Turf for Roosevelt Island Ball Fields - Is That a Good Idea? Octagon Pony Baseball Field, located south of the tennis courts and north of the soccer field. The Pony Field is primarily geared for baseball and softball. another softball/baseball field is located south of the Octagon Tennis Courts. Firefighters Field, a state-of-the-art softball/soccer field (near tram & subway) opened in spring 2003. While Firefighters Field is primarily geared for baseball & soccer, it also accommodates lacrosse and flag football. Yes, we are planning to install an artificial surface on the playing fields, being well aware of the discussion of a possible health hazard. We are following the issue closely. So far, nothing has been determined by the various experts to militate against use. As to details, they will be determined by the A/E firms engaged by RIOC, specifications and RFPs for the work. We will be sure to keep the community advised and will not do anything which would emperil the health of the users of the fields, following best practices at all times. Especially tuned into NYC Parks & Recreation determinations. There is the additional issue that once the nice weather arrives these fields will be reserved by corporate softball and soccer leagues such as Zog and not available for residents to play on unless paid for in advance with an hourly permit. What's next, paying for a permit to use the basketball and handball courts or for a seat at the Roosevelt Island Public Library. 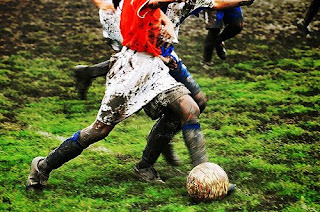 The muddy soccer field pictured above is not of Roosevelt Island but used for illustrative purposes. Will have more on the Franklin & Eleanor Roosevelt Institute presentation on the Louis Kahn design later but in the meantime RIOC has the web cast of the entire Town Hall meeting here. Watch it for yourself and decide though be warned it is more than 2 hours. RIOC has done an excellent public service in web casting the event so that those who were not able to attend will be able to view the proceedings as well as establishing a historical record of the event. Bloggers Roosevelt Island 360 and Press HD also took video of the proceedings so check them out as well though they have not yet posted any video. 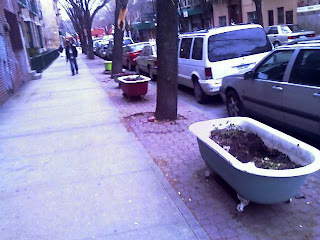 I was recently walking down one of my favorite streets in Williamsburg, Grand & Havermeyer, when I came across these colored bathtub flower planters which brought a smile to my face and to those walking by at the same time as well. This is the type of creative and whimsical street design that makes urban living interesting and is sorely lacking on the mostly sterile Roosevelt Island. 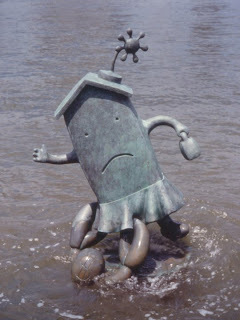 The only exception to Roosevelt Island's lack of creative design elements are the Marriage of Real Estate and Money sculptures located in the East River near the Manhattan Park swimming pool by Tom Otterness that are quite delightful. It would be a great public service to Roosevelt Island if RIOC and/or property owners such as Hudson/Related, Manhattan Park, Octagon and the WIRE buildings would encourage more unique and creative design for our benches, garbage receptacles, storefronts etc. 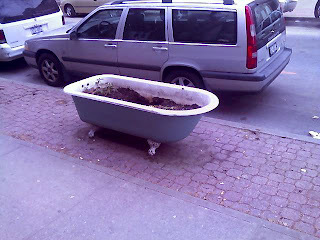 Just like the Williamsburg bathtub flower planters. Council Member Jessica Lappin's March 2008 News Bulletin contains information of interest to high school freshmen and sophomores as well as their parents regarding college admissions. An April 3, 2008 forum for High School freshmen and sophomores on college admissions. Are you a high school student thinking of going to college? Do you have a child or grandchild thinking of going to college? Do you keep reading articles about how competitive the college admission process is getting? Do the panoply of standardized tests – SAT, PSAT, ACT, AP – scare you? Do you know what “panoply” (good SAT vocabulary word!) means? To learn answers to these questions and others, we invite you to join Council Member Jessica Lappin and a panel of college admission experts to learn what high school freshmen and sophomores should be doing to prepare for applying to college. College preparation does not have to be so scary, overwhelming, or mysterious. Topics covered will include: academics-courses and grades, standardized testing, extracurricular activities, internship opportunities on the Upper East Side and in New York City, summer plans, and organizing tips. Panelists will include: admissions representatives from SUNY, CUNY, Columbia, Barnard, and Fordham; the director of programming from Let’s Get Ready (a non-profit which prepares high school students for college); and a former Princeton Review teacher and site director. When: Thursday April 3, 2008 from 6:30 - 8:30 p.m. This is an excellent community service provided by Council Member Lappin. RIOC's Director of Engineering provides the following information on the recent incident involving sparks coming from an electric box near 425 Main Street that resulted in this "stray voltage" post. testing cycles and any scheduled testing for 2008. This had nothing to do with ConEd power distribution or street lights. The cord was replaced by the contractor Monadnock. responded to immediately by Public Safety and the areas cordoned off. informed of any planed testing and test results. Good job by RIOC in responding so quickly and thoroughly with explanation on what occurred and in monitoring potential problems with stray voltage. UPDATE - 4/15/08: InfraShock is a resource for all things concerning stray voltage including a map of stray voltage hot spots. Your first step may be your last! Pedestrians, distance yourself from street and traffic lamps and make it a routine to avoid metal grates and manholes when possible. All of them have the potential to be energized year-round. Wintry moisture and accumulated rock salt will heighten the risk, as will precipitation and flooding conditions. Try to minimize the chance of injury by being focused and alert on your stroll. Avoid propping a metal object against the lights; cyclists, lean or lock your bike onto non-electrical equipment instead. Dog walkers, utilizing a non-metal leash is a safer option. If your dog is resistant to an area it may be energized, so choose an alternative route and notify Con Edison (800-75-CONED) if you are suspicious. If your canine is reacting, do not touch your pet or the live area with your hands or any conductive material. The Franklin & Eleanor Roosevelt Institute (FERI) will present their eagerly awaited new design images for the Louis Kahn/FDR memorial at a Town Hall meeting to be held on Roosevelt Island tomorrow night March 25 at 7 P.M. in the Good Shepherd Community Center (543 Main Street). 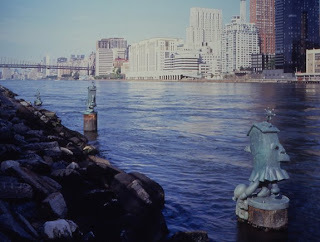 Many Roosevelt Island residents have long opposed the Kahn Memorial (disguised as a FDR memorial) proposed more than 35 years ago for the southern tip of Southpoint Park because, among other reasons (i.e. $20 million in taxpayer funds being sought), these existing panoramic views of the East River Waterfront and NYC skyline will be obstructed and destroyed by the massive concrete and granite mausoleum that is the memorial. Here is another 360 degree You Tube video of Southpoint Park. The Kahn supporters claim that memorial opponents are not visualizing the existing drawings, plans and models correctly. They say it takes the eye of an architect or artist to understand that the waterfront and skyline views we all so cherish will not be blocked by the memorial. 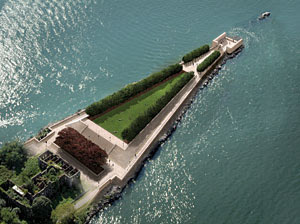 As soon as the new images of the Kahn/FDR memorial are presented, objections made by common citizens based upon waterfront views being destroyed will be overcome. Here are the current images of the Kahn/FDR memorial. Well, it certainly does not take the eye of an architect or artist to be able to read the following description of the Kahn/FDR memorial which confirms Roosevelt Island residents fear that the Kahn design will in fact, and was intended to, destroy the current one-of-a-kind views of the East River and NYC waterfront from the Southern tip of Southpoint Park. 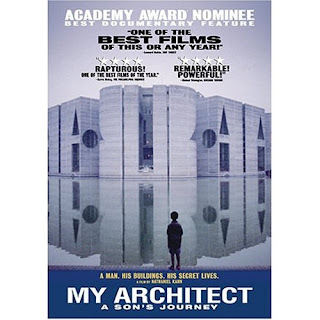 Here is the unbiased, non-residents description of the Kahn/FDR memorial by Robert McCarter, author of Louis I. Kahn, which has been described as the authoritative text and definitive monograph on the architect Kahn's work. 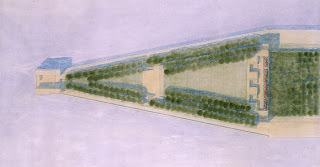 ... To reach the Memorial Room, we would descend gradually through this 350 foot (107 metre) long garden to the point the trees come together, about three-quarters of the way down the Island, where we would enter the narrow plaza connecting the two waterside approaches and the two gardens. All ways now lead across this second smaller, funnel-shaped 115 foot (35 metre) long garden, also defined by two tightly spaced rows of trees on either side which come together at the southern end to frame our view of the statue. 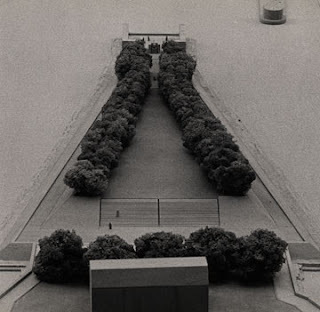 We now enter the paved, wedge-shaped, bridge-like forecourt, 50 feet (15 metres) long, into which at the southern end is placed the plinth on which is the stature of Roosevelt. It is in this forecourt that we are given our first- and last- view of the midtown New York Skyline to the west, previously blocked by the trees of the garden, and to be blocked again by the walls of the Memorial room. (emphasis added). We must move around this statue to either left or right and through the 12 foot (3.7 metre) wide opening into the room of the memorial. It is in this forecourt that we are given our first- and last- view of the midtown New York Skyline to the west, previously blocked by the trees of the garden, and to be blocked again by the walls of the Memorial room. "Louis Kahn would have done it differently if he were alive today," said Charles McKinney, the consultant in charge of the Roosevelt Island park proposal for the Trust for Public Land. "He was well known for his concerns about creating communal spaces, and he would have understood the importance of this community's concerns, and he would have responded." 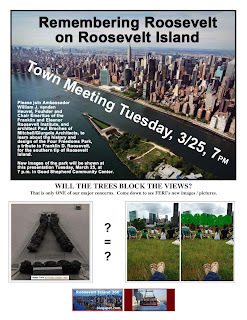 It is extremely important if Roosevelt Islanders want to enjoy unobstructed, beautiful East River waterfront, Manhattan, Brooklyn, Queens skyline views and the Wild Gardens/Green Rooms designed for Southpoint Park by Trust for Public Lands that you attend this Town Hall meeting. 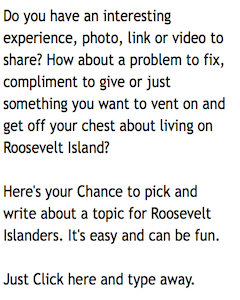 Do not cut Roosevelt Island's Southpoint Park off from the East River! I kid you not on this. According to the 3/23-24 24 hour Roosevelt Island Public Safety Report there is a beaver on the loose in the Motorgate Parking Garage. Loose Animal-At 688 Main Street (Motorgate Garage) PSD receive a report of a loose beaver. Search made with negative results. There have been other public safety incidents at the Motorgate Parking garage during the past few days. From the Roosevelt Island 24 hour Public Safety report. Unsecured Vehicle - Window left open in Motorgate. With parking rates scheduled to increase soon, I would hope that the Motorgate operators will spend some money improving security in their facility. It would also help if people kept their car doors and windows closed and locked.